I tried shooting this photo with the Holga but the light levels were too low, the scene was well suited to the grain and distortion of that camera. It’s a shame, but the trusty D70 came through. A nice still-life shot. Well done! I guess this must be a corner in an old shed? 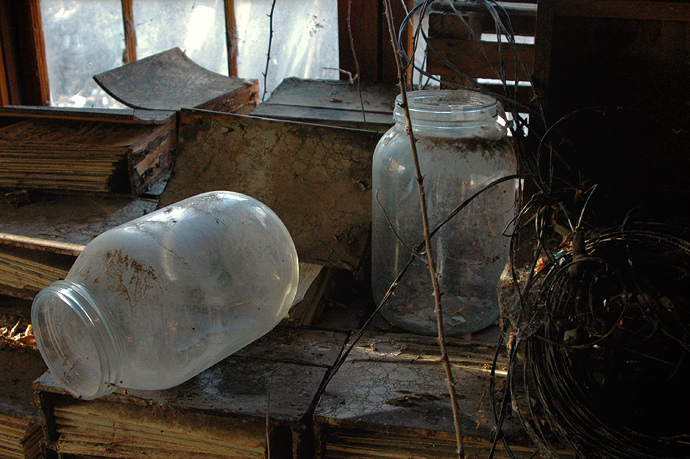 These neglected items have made a nice rustic still life. The D70 has certainly done a good job. Well seen. This one would make a great print to frame and hang. I've had storage buildings like this with Mason jars sitting around like these jars. I love it.